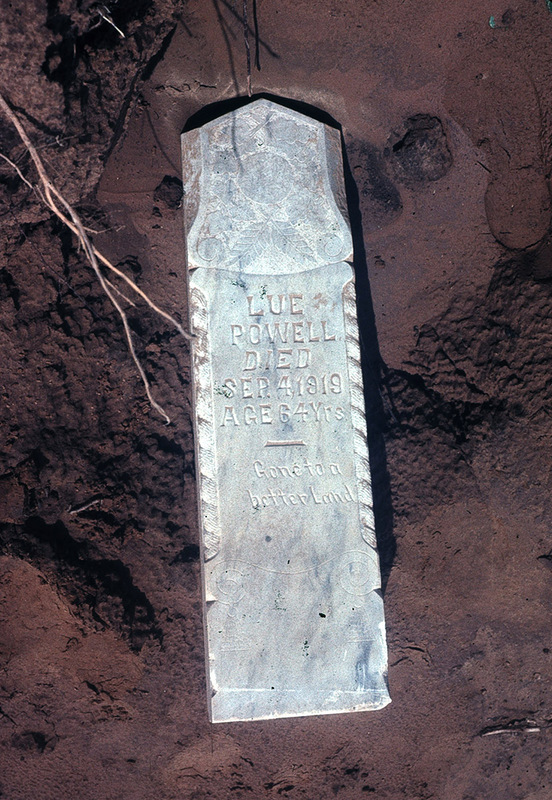 In the 1980s the Arkansas Archeological Survey spearheaded a project that changed the way both archeologists and the National Park Service approach historic cemeteries. Cedar Grove Cemetery in southwestern Arkansas was associated with the Cedar Grove Baptist Church, an African-American church founded in 1881. In 1927 historic flooding buried the area around the church under more than a meter of silt—including the cemetery. Later the church was rebuilt in a different location. Because of these circumstances, the individuals buried in Cedar Grove Cemetery had been lost to history, but from the proper excavation of their mortal remains archeologists learned about the health, diet, work load, and cultural beliefs of the community that used Cedar Grove Cemetery from around 1900 to 1915. An eroding bank of the Red River near Cedar Grove Cemetery. "Gone to a better land". 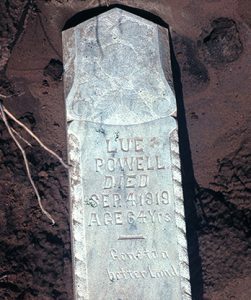 A uncovered headstone from Cedar Grove Cemetery. 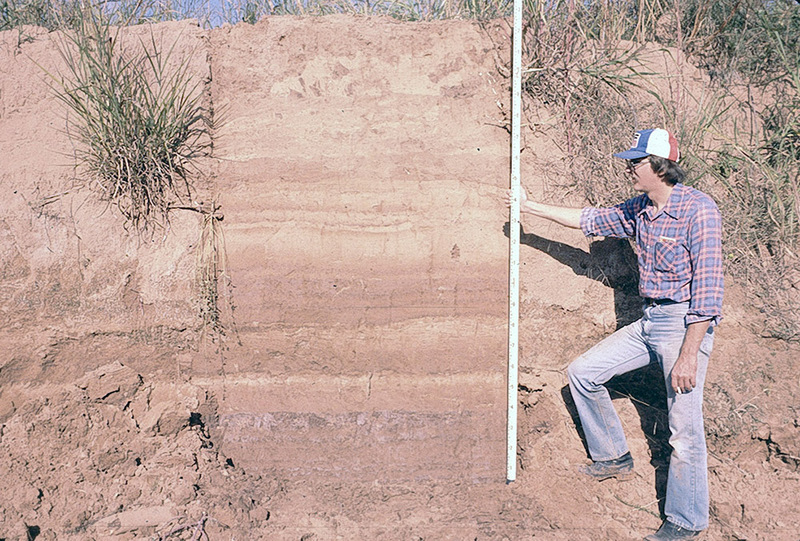 In 1980 local residents reported human remains eroding from the bank of the Red River. Because of this same erosion, the Corps of Engineers decided to revet the banks of the river in this location. The Arkansas Archeological Survey argued that the cemetery, along with a prehistoric site located underneath the cemetery, had to be documented and moved as they were eligible for inclusion on the National Register for Historic Places under Criteria D—the ability to provide information about the past through archeological investigation. At the time historic cemeteries were not often listed on the National Register, and none had been considered eligible under Criteria D. The Arkansas Archeological Survey’s argument was convincing, and we were contracted by the Corps of Engineers to conduct the project. It soon became clear, however, that the cemetery was much larger than the nine existing grave markers indicated. It was in fact the resting place of more than 88 people. The Survey worked with the congregation of Cedar Grove Baptist Church to design a plan for the removal, analysis, and reburial of the 88 individuals. To learn more about the Cedar Grove project and its national significance watch this video produced by the Arkansas Archeological Survey for the Making Archeology Public Project, a video series in celebration of the 50th anniversary of the National Historic Preservation Act. Gone to a Better Land: Cedar Grove Cemetery and the National Historic Preservation Act from Making Archaeology Public Videos on Vimeo.